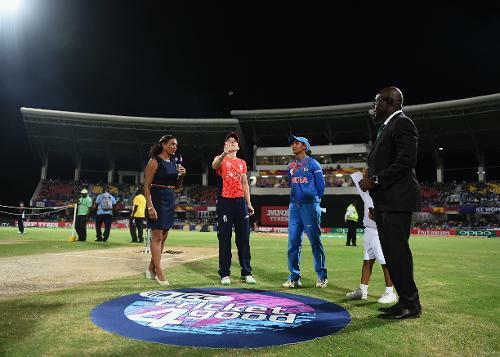 General view of the toss during the ICC Women's World T20 2018 Semi-Final match between England and India at Sir Viv Richards Cricket Ground on November 22, 2018 in Antigua, Antigua and Barbuda. 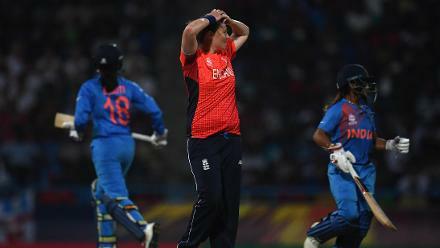 Anya Shrubsole of England (C) reacts during the ICC Women's World T20 2018 Semi-Final match between England and India at Sir Viv Richards Cricket Ground on November 22, 2018 in Antigua, Antigua and Barbuda. 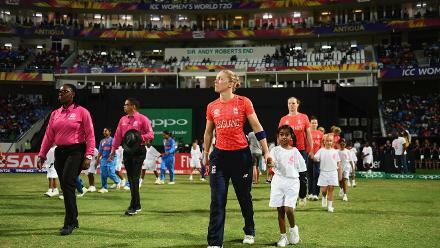 Heather Knight of England leads out her side for the national anthems during the ICC Women's World T20 2018 Semi-Final match between England and India at Sir Viv Richards Cricket Ground on November 22, 2018 in Antigua, Antigua and Barbuda. 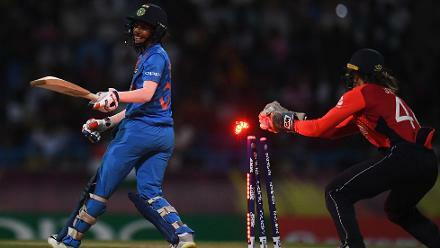 Amy Jones of England attempts in vain to stump Jemimah Rodrigues of India during the ICC Women's World T20 2018 Semi-Final match between England and India at Sir Viv Richards Cricket Ground on November 22, 2018 in Antigua, Antigua and Barbuda. 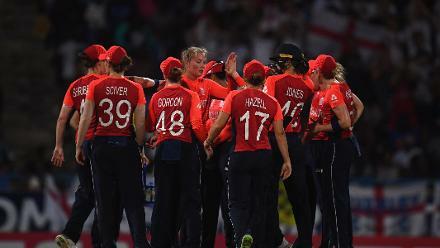 Sophie Ecclestone of England(C) celebrates after dismissing Smriti Mandhana of India during the ICC Women's World T20 2018 Semi-Final match between England and India at Sir Viv Richards Cricket Ground on November 22, 2018 in Antigua, Antigua and Barbuda. 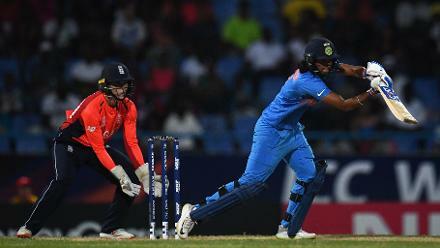 Harmanpreet Kaur of India bats during the ICC Women's World T20 2018 Semi-Final match between England and India at Sir Viv Richards Cricket Ground on November 22, 2018 in Antigua, Antigua and Barbuda. 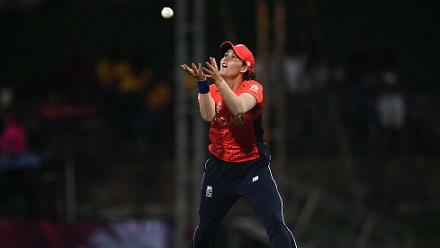 Natalie Sciver of England takes a catch to dismiss Taniya Bhatia of India during the ICC Women's World T20 2018 Semi-Final match between England and India at Sir Viv Richards Cricket Ground on November 22, 2018 in Antigua, Antigua and Barbuda. 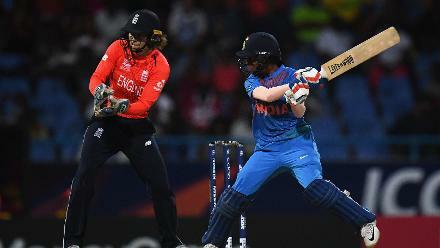 Jemimah Rodrigues of India bats during the ICC Women's World T20 2018 Semi-Final match between England and India at Sir Viv Richards Cricket Ground on November 22, 2018 in Antigua, Antigua and Barbuda. 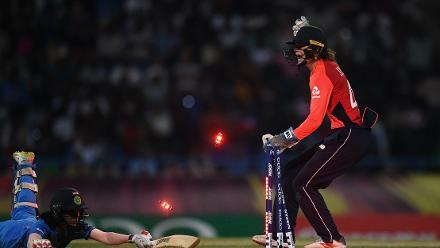 Amy Jones of England(R) reacts as she runs out Jemimah Rodrigues of India during the ICC Women's World T20 2018 Semi-Final match between England and India at Sir Viv Richards Cricket Ground on November 22, 2018 in Antigua, Antigua and Barbuda. 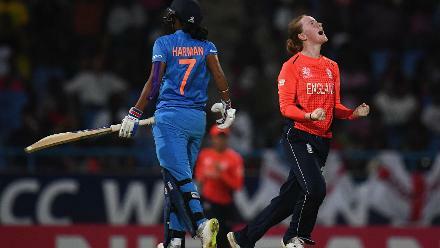 Kirstie Gordon of England celebrates after dismissing Harmanpreet Kaur of India(L) during the ICC Women's World T20 2018 Semi-Final match between England and India at Sir Viv Richards Cricket Ground on November 22, 2018 in Antigua, Antigua and Barbuda.